"This is one of my 'go to' recipes and it takes only about 15 minutes from start to finish. The only prep work really is mashing the garlic. The sauce is great on any pasta, but I prefer angel hair or spaghetti." Pour olive oil into cold skillet. Add garlic, capers, anchovy paste, and red pepper flakes. Place over medium heat and cook and stir until the oil is infused with the flavors of the mixture, about 5 minutes, taking care not to brown the garlic. Add tomato sauce and rinse jar with 1/4 cup water; add water to skillet. Pour in wine and juice from clams, reserving the clams. Bring to a simmer until slightly reduced and thickened, 7 to 9 minutes. Bring a large pot of lightly salted water to a boil. Cook spaghetti in the boiling water, stirring occasionally until almost al dente, or about 1 minute less than directed on package. Drain. Return pasta to the pot off heat. Stir clams into the sauce. Pour sauce over pasta. Stir; cover the pot to allow it to finish cooking off heat and to allow the pasta will absorb some of the sauce, about 3 minutes. Stir in Parmesan cheese. Top with chopped fresh basil and/or parsley. The written instructions are incorrect. The wine and juice from clams should be poured in and reduced before the tomato sauce and water. As usual, Chef John does not disappoint. Easy and delicious! Didn’t change a thing. Great and fast meal, IF you like clams. 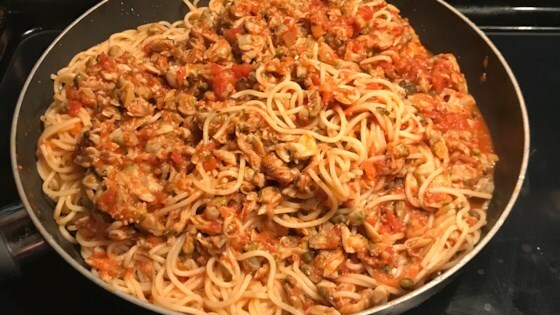 The only thing I did differently was to add 4 cans of CHOPPED clams (they are larger than the minced), and drained 2 of the cans. This recipe is easy and quick to make. It has a lot of flavor as well. I would not change a thing. My husband loved it and I will make it again for sure.